The U.S. Consulate in Toronto and Global Public Affairs hosted this event to hear from a select group of U.S. infrastructure leaders operating in Canada. The discussion covered the current opportunities and challenges of pursing P3s for infrastructure development in Canada, as well as areas for cross-border collaboration. The event format was an informal roundtable discussion over lunch. 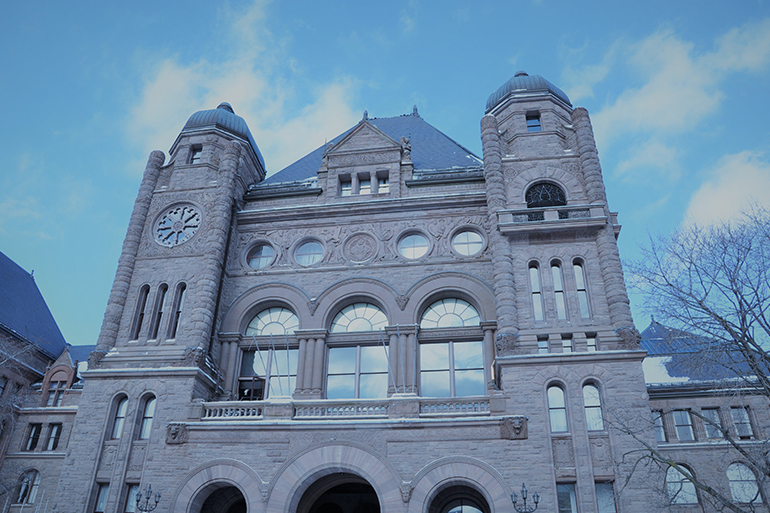 The Infrastructure Lab’s Chair, David Caplan, was the provincial minister of infrastructure behind introducing Ontario’s (AFP) public-private partnership model as it is in use today. 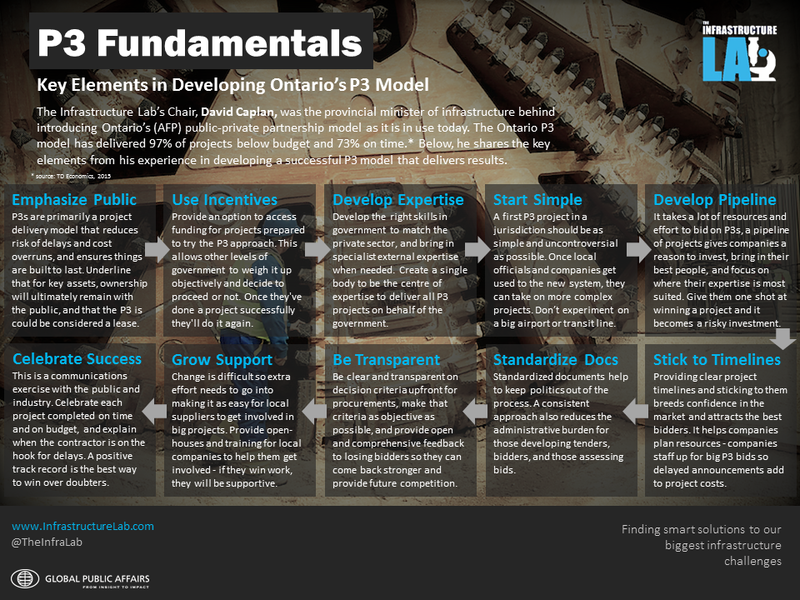 The Ontario P3 model has delivered 97% of projects below budget and 73% on time. * Below, he shares the key elements from his experience in developing a successful P3 model that delivers results. Emphasize Public: P3s are primarily a project delivery model that reduces risk of delays and cost overruns, and ensures things are built to last. Underline that for key assets, ownership will ultimately remain with the public, and that the P3 is could be considered a lease. Use Incentives: Provide an option to access funding for projects prepared to try the P3 approach. This allows other levels of government to weigh it up objectively and decide to proceed or not. Once they’ve done a project successfully they’ll do it again. Develop Expertise: Develop the right skills in government to match the private sector, and bring in specialist external expertise when needed. Create a single body to be the centre of expertise to deliver all P3 projects on behalf of the government. as possible. Once local officials and companies get used ‎to the new system, they can take on more complex projects. Don’t experiment on a big airport or transit line. Develop Pipeline: It takes a lot of resources and effort to bid on P3s, a pipeline of projects gives companies a reason to invest, bring in their best people, and focus on where their expertise is most suited. Give them one shot at winning a project and it becomes a risky investment. Stick to Timelines: Providing clear project timelines and sticking to them breeds confidence in the market and attracts the best bidders. It helps companies plan resources – companies staff up for big P3 bids so delayed announcements add to project costs. Standardize Docs: Standardized documents help to keep politics out of the process. A consistent approach also reduces the administrative burden for those developing tenders, bidders, and those assessing bids. Be Transparent: Be clear and transparent on decision criteria upfront for procurements, make that criteria as objective as possible, and provide ‎open and comprehensive feedback to losing bidders so they can come back stronger and provide future competition. Grow Support: Change is difficult so extra effort needs to go into making it as easy for local suppliers to get involved in big projects. Provide open-houses and training for local companies to help them get involved – if they win work, they will be supportive. Celebrate Success: This is a communications exercise with the public and industry. Celebrate each project completed on time and on budget‎, and explain when the contractor is on the hook for delays. A positive track record is the best way to win over doubters.